The family of Qwentyn was on a four day cruise, and are from Winter Garden, in Central Florida. The question of passenger safety on cruise ships is central to every single article published in the Florida Injury Lawyer Blawg. None of these questions is more crucial than the safety of children passengers. Last March, an incident occurred on a Disney Cruise ship where a 4-year-old child nearly drowned. He sustained catastrophic brain injuries as a result of being deprived of oxygen for a significant period of time. Two weeks following the near-drowning of this child, another child died at a Disney resort in Orlando. In both instances, no lifeguards were on duty at the time. Today, the tragic loss of Qwentyn Hunter brings the question of lifeguard presence on cruise ships back to the forefront. Should cruise ship market to families with young children and not provide basic safety to the most vulnerable? In Florida, owners of resorts owe their guests the duty to exercise ordinary care in providing a safe and proper place to bathe or swim. Settlement Reached in Minor Child Pool Entrapment Case in Orlando Resulting in Brain Damage. Generally, Florida owners get away with not hiring lifeguards if they place a conspicuous warning sign alerting all guests that there are “no lifeguards on duty”, even during pool hours. When a sign is inconspicuous and guests have the legitimate expectation that someone is watching over the swimming pool activities, owners have been found negligent. 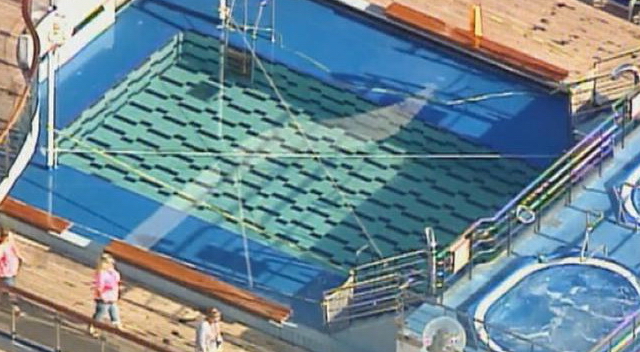 A thorough investigation and inspection of the swimming pool of the Carnival Victory will be determinant in establishing whether Carnival Cruise Lines adequately warned its passengers of the dangers from using the pool, or whether the lack of warning contributed or caused the tragic loss of Qwentyn. Beyond a cruise line’s obligations under the law, the question of overall safety and safety concerns for the cruise line industry remains. The three major cruise line companies, and Disney, market to families with children of all ages. Carnival, like the others, declares front and center on its website that “The safety and security of our guests is our top priority.” This phrase is typically repeated throughout the companies’ websites, TV ads, print ads, and brochures. There appears the age-old conflict between safety and corporate responsibility. Cruise lines will continue to sell safety and dream to their guests, while inconspicuously post that they only provide minimal safety measures, which they are obligated to provide under the law. Following the law is one thing, but in many cases unfortunately, it is far from enough. And it is certainly insufficient for any business who self-proclaims to be prioritizing safety and security to market itself. Visit our website to obtain more information about our cruise injury practice in the State of Florida and throughout the country.